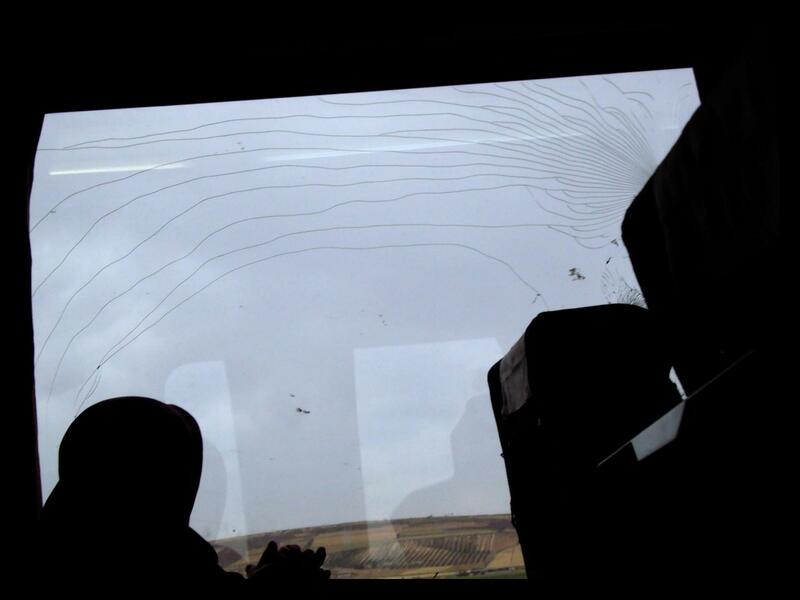 The windows of the train cars were fractured with ripples of broken glass, but the ten-of-seven a.m. was still busy with travelers heading north out of Damascus. The man next to me took turns thumbing through prayer beads on a wooden misbaha and napping; the older woman across the aisle looked out the window for all six hours. Skies were gray, ominous, and I heard a Syrian Eeyore pulling on a shisha pipe and kvetching in my head: “Looks like violence.” The next afternoon there would surely be clashes, as there had been in Syria for the past two months of bloody Fridays. That’s why we left for Aleppo on a Thursday, the last ticket out of town. As the train neared the station at Homs (or Hims), the city stared back with the empty eyes of black and deserted windows, overgrown gray-green grass, and neglect — a military operation known as “the Seige of Homs” began one week earlier on May 6th. The tracks passed through a tunnel in a tiny hill, on top of which sat a big Syrian tank camouflaged in brown and green. Another was slouched on a patch of grass under a bridge, and the entire crew was sprawled out on the turf, leaning against the treads, sitting watching the train go by. A small cluster of men milled about on the street opposite the platform. In the distance, I saw a soldier patrolling near them with a long rifle slung from his shoulder, gesturing to passersby. Two men boarded our car. No one got off. And that’s where the train turned around, pulling backwards out of the station towards everything we had come from. I had heard that two days earlier a train had been sent all the way back to Damascus from Homs (three hours), but no one else looked surprised. The conductor issued a message over the loudspeaker that sounded like he kept his microphone in a paper bag underwater. Still, the other riders gave away nothing in their faces. Maybe they did this every day: hopped on the train and hoped it would make it to Aleppo. Maybe the train itself was the destination, an upgrade to the daily grind — four American dollars for a first-class ticket to wherever-you-got-on. But still their quiet was a comfort, and I waited for the train to switch tracks, or to make a wide looping double-back. Between my watch and my phone, I had two compasses and could have charted our course more exactly, but I knew what to feel for. Or I thought I did — hours later when nothing still looked familiar and the train had never changed course, we cruised into the outskirts of Aleppo. I was very, very confused and it was raining. But we were there. We needed somewhere to sleep, and as the only non-Syrians with suitcases in the entire city, we were looking for a deal. Sadly, fifty-dollar per night boutique joints are less likely to bargain than seven-dollar per night inns with rooms on the roof (down to four dollars), but those four dollars will still go less far towards sleepable furniture in Syria than they would in say, Sri Lanka, or an airport Starbucks. For ten dollars, there was the Jawahir Hotel, cozy and fine — tea and internet and black humor about the demonstrations — but no desire to play the game. There were better deals out there: for our negotiations at the new, utterly empty four-star hotel in the heart of the old city, we earned an offer so sweet we felt guilty to accept. Though Aleppo itself had been and has continued to be quiet throughout the uprising in Syria, media had pressed tourism from almost everywhere. We approached the desk and the receptionist flicked her eyes at the door, with a nearly inaudible “Mahmoud!” fired at the bellhop. Mahmoud struggled to compromise jogging and elegance to be as fast as possible where we were and not where he was. If history ever itemizes the successes of the Syrian protestors who seek an end to corruption and tyranny, it may include their indirect effect on discounts of nearly eighty percent on at least one hotel that was really quite lovely. We promised the manager we would not divulge the details of our negotiations, of which establishment had bent its rules in these unusual times, but that we would advertise the hotel by other means. I’ll say only that the Carlton Citadel Hotel in Aleppo is housed in what was once the National Hospital, a stone mansion built by the Ottomans centuries ago. And the room service is unbelievable. And once again, we had burrowed deep into the incongruous insulation of the untouched city, only miles from the roaring crowds that would be heard worldwide on the next day’s news. The old city swept out around the Citadel, which perches on a hill that long ago held all of Aleppo inside its stone walls; now, the thick souqs below market comfort: the famous olive and bay leaf soap, hamaam where skin is scrubbed soft, cafes for endless tea and shisha. Mixed with grit and tradition, this is what the city has always been. I swallowed this (and a forkful of spaghetti bolognese) and admonished myself for calling coziness counterfeit and for trusting only danger as real. I wasn’t fully convinced, but it was late. I consulted an iPhone Arabic dictionary and called down to the front desk: two pillows, please: room 111. Adam previously worked for The Onion and The Colbert Report and has reported for Haaretz in Tel Aviv. This year, he founded the website INGULFED.com, where he has published travel stories and photography from thirteen countries largely off the beaten tourist track, including Azerbaijan, Kuwait, Syria during the uprising, Pakistan, and Afghanistan. He current lives in Abu Dhabi.